You can call Out of Africa wild; you can call them crazy--but just don't call them a zoo. At least, that's what their ads say. 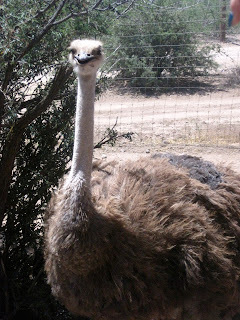 I first visited Out of Africa Wildlife Park when they were still in the Phoenix area, years ago. Then about eight years ago, they opened up a new (replacement) location closer to home, in Camp Verde, which I visited again last weekend. Out of Africa was founded by Dean and Prayeri Harrison--with complete respect for the animals, hence the "not a zoo" thing. The park is founded not only on giving people an opportunity to see these wonderful animals, but also to give them the care they need and to understand how to form relationships with them. 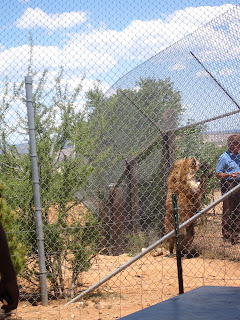 You can see it in the way the animals respond to and interact with any of the park's team. They're not putting on a show; they're living their lives and letting us in to participate. As you board the bus, they hand you a carrot, which you feed either to a giraffe or camel. Almost right away, our driver stopped us by a giraffe that was disinterestedly standing away by a tree. But he called out to Pilgrim, and sure enough, Pilgrim eventually sauntered over in hope of snacks. Standing up, pretty much everyone got to feed Pilgrim. While I've fed a giraffe in a different park, leaning over the edge of a lookout to pour feed onto a giraffe's tongue just isn't the same as feeding it this close up--the group dynamic helps, too. You watch as everyone else in the bus reaches their hands out, some getting more "tongue" than others and then giggling about the sliminess. This is an ostrich. Isn't she very pretty? But watch out--her beak is sharp. She, however, has no fear around the people she knows she can trust. Our guide got out and gave her a hug and helped her move around the bus so that everyone could see her up close. Another shot (I think) of Pilgrim later on, once we had gotten off the bus and were walking up toward the other animals (the safari area is closet to the park entrance; everything else is deeper in). You can take a tram if you don't want to walk, but walking is much nicer (unless you're from out of state and are finding the weather too hot). 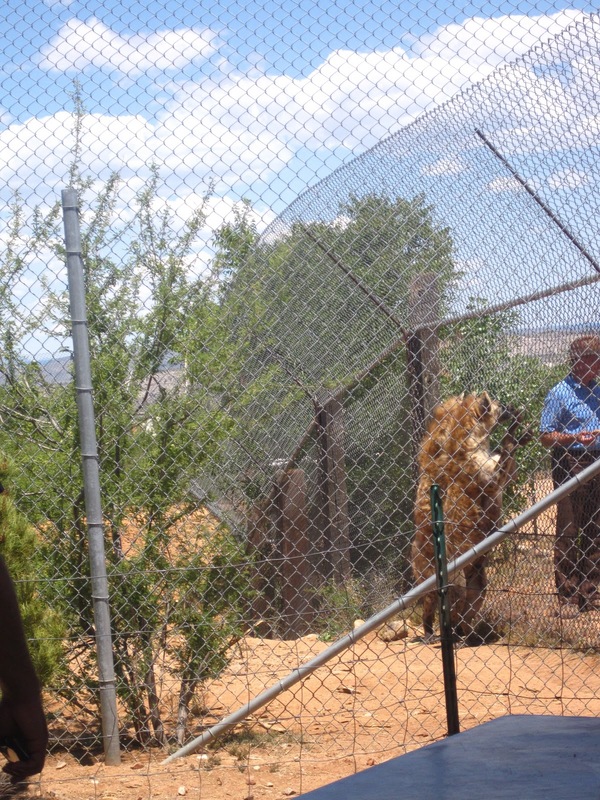 While we were stopped out by the hyenas, Dean showed up and began speaking with the crowd about them. At one point, he pet (or should I say cuddled) one of the hyenas through the fence; it obviously enjoyed it. I know a dog with a similar hideously-ugly-in-a-cute-way look that makes the exact same smile. Here you can see how big the hyenas actually are--thick, too. In the afternoon, you can follow the feeding truck along the path. This is the time when the lazy cats decide to wake up and you have a chance to see animals that might have been hiding before. The hyenas are my favorite: they stand up against the gate sort of like they are in this picture and make their ridiculous laughing monkey sounds. They're vicious predators, perhaps, but they sound adorable. The park does have a main show, Tiger Splash. But it isn't about telling the tigers to sit and stand and jump through hoops. Dean is there, explaining part of his philosophy about building relationships and trust with animals and understanding how their minds work. He has a team with him who bring out different toys to play with the two tigers. Just picture a bigger version of your cat when you're waving its feather wand toy. Sometimes they jump in the water with the toy; sometimes the tigers follow and sometimes they don't. Always you can tell that the tigers are just playing and that they understand not to harm their people buddies. Accidents are of course still possible, but neither one wants that to happen. Here is Liberty relaxing after the show; she was getting full because guests always have the opportunity (for $5) to feed one of the tigers (two pieces of meat) using prongs through the gate. She gurgle-growled a little when I fed her. It's a wildlife preserve; it's a habitat. It's privately-owned. It does great work for everyone involved. It's Out of Africa.